This recipe has changed my life, seriously. As an ice cream addict I needed to find another healthier route…this Banana Ice Cream (or “nice” cream) is it! It has become a nightly treat and a healthy one that I feel good about. Fast, vegan, gluten and dairy free it is a staple! We all LOVE pizza right? This recipe will give you an excuse to eat it more often…Yay! This is also an easier and faster alternative to a cauliflower crust as you don’t have to cook the carrots (as you do the cauliflower) before you make the “dough”. It’s gluten free (can be made vegan) and packed with veggies but still has that “pizza” feel without being naughty…even though naughty is good sometimes! 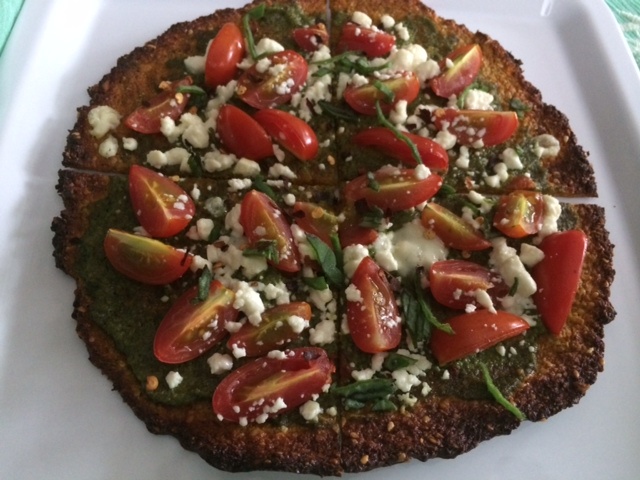 This one is covered in pesto, queso fresco (that’s what I had in the fridge) and fresh cherry tomatoes. 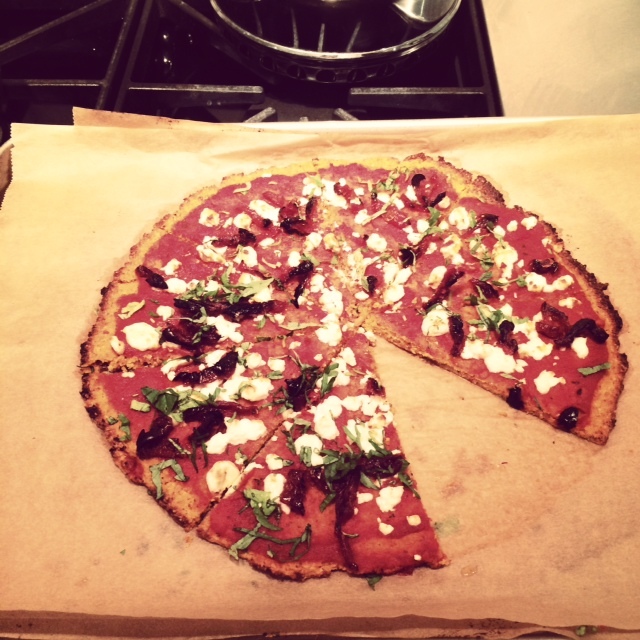 This one is with tomato sauce, Greek feta, sun dried tomatoes and Cuban oregano…YUMMM!!! Preheat the oven to 425 degrees. Place carrots, almonds, garlic, 2 tablespoons of the oil and salt in a food processor fitted with the metal “S” blade. Pulse until well broken down and very fine- like the consistency of rice. Remove the lid a few times and scraping down the sides. Add the egg and pulse again until combined. Consistency should be moist but not too loose. Line 2 baking sheets with a silicone mat or parchment paper and lightly oil with the remaining tablespoon olive oil. Divide the mixture in half. Press each half down on the baking sheet into a round and flat pizza shape about 1/4 inch thick (do not make too thin or it will break). Bake for 25-30 minutes or until the edges are beginning to brown. Remove from oven and allow to cool slightly. Using a flat spatula loosen the crust from the parchment all the way around. Top evenly with desired sauce and toppings and return to oven for 6-8 more minutes. Cut and serve! For a crunchier texture- add 1/2-3/4 cup shredded parmesan cheese to the carrot mixture. You will want to decrease the salt however. To make it Vegan- try substituting “flax eggs” for the farm eggs. This dish is perfect for spring! I love this pesto and it works for all sorts of applications. Bright, healthy and vibrant it will change the way you think of pesto! Preheat broiler or grill on high. If using the broiler, adjust oven rack closest to the broiler. Cut off about 2-3 inches from the bottom ends of the asparagus and discard. Lay asparagus on a baking sheet and toss with 1 tablespoon olive oil, season with salt and pepper and toss well. If you are using the broiler; place the asparagus in the oven on the top rack and broil for 6-8 minutes or until tender but firm in the middle. If you are grilling; place the asparagus on a hot grill, for about 4-6 minutes. Time will vary based on thickness of the stalks. I like mine on the snappy side. Meanwhile, place all ingredients for the pesto in a food processor and pulse a few times to combine. Mixture should be smooth but not entirely pureed. Taste and adjust as you wish. Add more jalapeño for heat, citrus juice and/or salt to brighten it up. 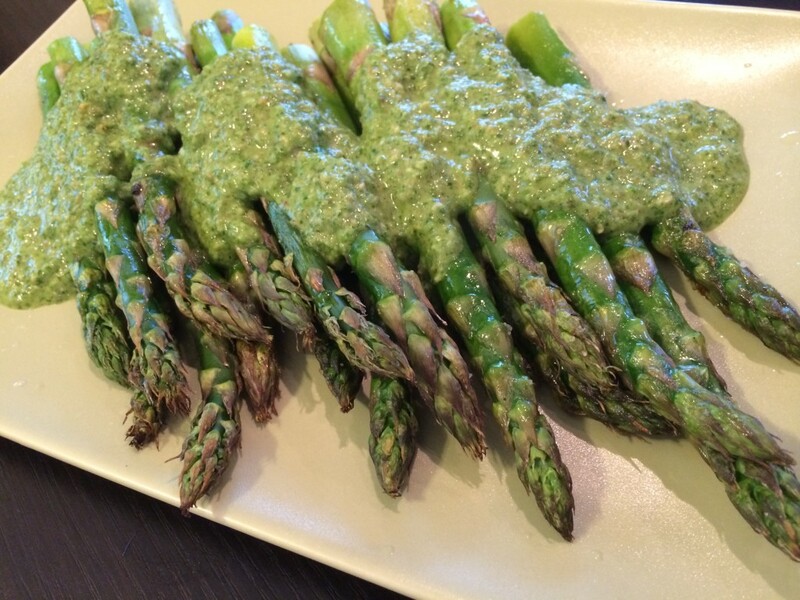 To serve~ Place the asparagus on a large plate and top with the pesto. Garnish with the toasted pepitas and a squeeze of lemon. Serve warm or at room temperature. This recipe works with many different herbs such as parsley, basil, dill, mint or a mixture of them. Change out the pepitas for sunflower seeds or any other toasted nut you like. *To toast the pepitas~ spread out on a baking sheet and toast at 325 degrees for 10-12 minutes or until golden brown. I like to use my toaster oven. You can also do this in a saute pan on the stove. 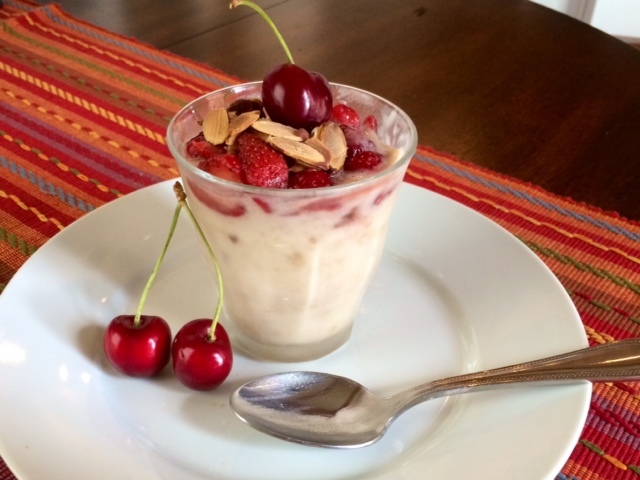 This recipe is a revelation…a way to indulge and feel great about it! True alfredo sauce is one of these foods that is pretty much on the “do not eat” list. But this recipe takes it to another level, fun, delicious, unique…oh and vegan, gluten free to boot! Do not fear however…it will KNOCK your socks (or tastebuds) off! Trim the ends of the zucchini and then julienne lengthwise on a mandolin or with a julienne peeler as far as you can go. Save the core of 1 zucchini for the sauce, and the rest for another use such as a stir fry. Place the shredded zucchini into a bowl with the salt and toss well. Set it aside for 20+ minutes to allow the salt to draw out the liquid out of the zucchini. When you can see liquid released at the bottom of the bowl: use a clean lint-free kitchen towel or cheesecloth to squeeze the zucchini and remove excess liquid. Squeeze into a small bowl and reserve. Drain the cashews and place in the blender. Add the remaining ingredients for the sauce and blend well. Taste and adjust salt if necessary. 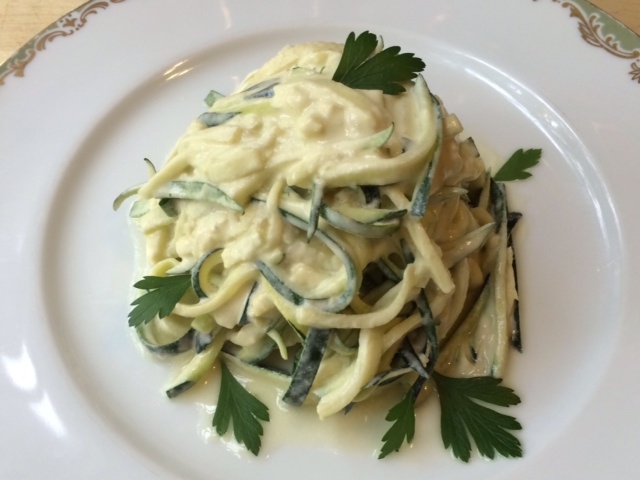 Place the zucchini ribbons in a large sauté pan and heat gently over medium heat, heating it through but not cooking. Add the sauce, lightly salt and toss well. Pile onto a large platter or plate individually and top with a little drizzle of olive oil and some chopped basil or parsley if desired. Watch our Mandolin 101 video for a full demo on how to use one of my favorite kitchen tools! This sauce also works well over whole wheat or quinoa pasta and veggies such as broccoli and cauliflower. If you do not have the yeast you can use parmesan cheese but it will not be vegan and you will need to use less salt to season. *Nutritional Yeast is the byproduct of the molasses brewing process. It is high in all sorts of B vitamins and has a “cheesy”flavor. You can find in heath food stores usually in the bulk section or near the spices. This is complexity different than regular yeast and is not interchangeable. You can however use brewers yeast if you cannot find but it is not gluten free. **Miso paste is available in many grocery stores in the refrigerated section. There is white, yellow, brown and red miso. “Mellow white” or “sweet white” will be the most mild. You can however use any kind for this recipe but you may need to decrease the amount a bit if you are using a stronger one. 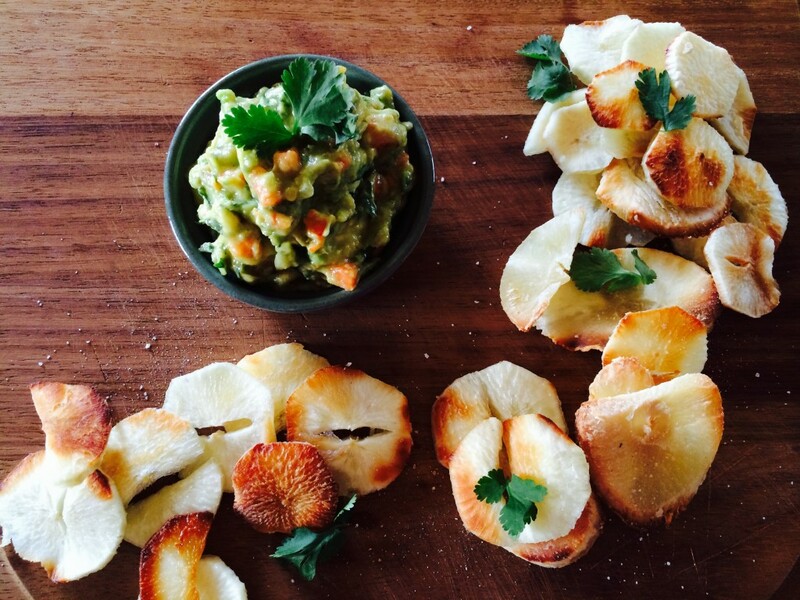 Chips and Guacamole are one of my favorite snacks…I even make it a meal sometimes. These baked yuca chips are an easy and healthy alternative that are unique and of course vegan and gluten free to boot. They are super easy! Did I mention delicious? 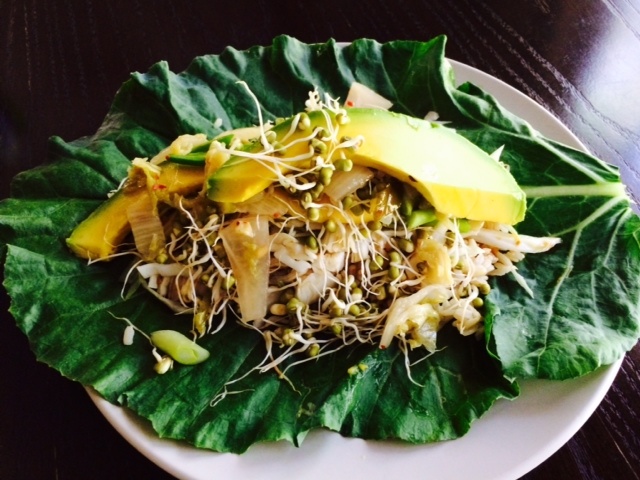 This wrap is incredibly easy and can stand in as a full meal. Treat the recipe as a blank canvas and add anything that you think might be good. Jazz up the rice a bit, or use a different sauce. Make it Asian with a soy dipping sauce, or take a Latin or Italian route…get creative!